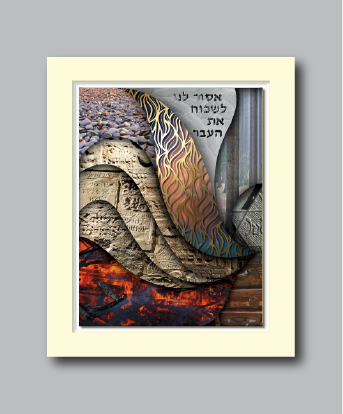 “Teardrops on the Fire” hearkens back to one of the darkest eras of Jewish history; the Holocaust. At the base of the design, ashen shards blaze in a burning fire. 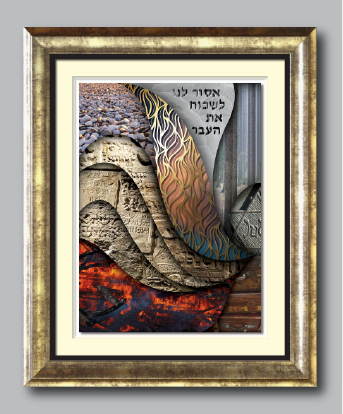 Above is a multi-layered mosaic of fragmented and destroyed Jewish gravestones. A never-ending sea of stones rests above. These stones represent all of us, as well as the descendants of those who survived. In Jewish tradition, it is customary to leave a stone on the headstone of a loved one after a cemetery visit, indicating that the interred person was not forgotten. In the foreground, an illuminated organic shape symbolizes the ascension of millions of martyred souls returning to Hashem. The movement of the shapes on the left move the eye towards the bottom right corner of the art piece. There, we see a stack of battered suitcases, representing the Nazi lies of relocation told to unsuspecting Jews who were in fact, sent to concentration camps and in many cases, immediate death. "Juden", the recognizable brand forced upon Jews hovers above. Beyond, in the upper right corner is a forest of Fir trees where many Jews were brutally shot, killed and left en mass in unmarked graves. 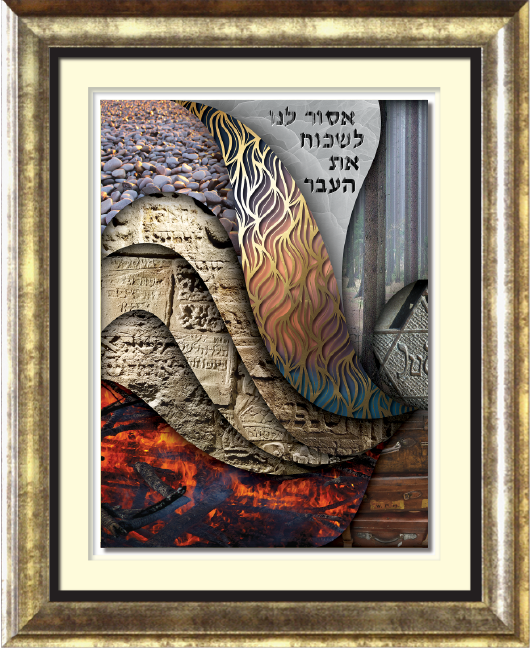 Adjacent, is a field of billowing smoke with Hebrew words that translate to "We must never forget the past".